Located at the Hudson River, just a couple of blocks west of Times Square in Manhattan; the Manhattan West Wide Cruise Terminal is one of the busiest cruise terminals in the whole of the United States. The terminal is actually the 4th busiest cruise ship terminal boasting about 625,000 passengers every year. Are you planning a trip to the terminal? You can rely on our car service from Long Island to Manhattan Cruise Terminal. We offer some amazing limo and car services that will make your journey to the ship terminal amazing. Some cruise lines served by Manhattan West Side Cruise Terminal include Norwegian, Carnival, Holland America, Princess, Crystal, Cunard, Silversea, Seaborn, and Seven Seas. So are you ready to go on a cruise at this terminal? Do you need the perfect ride for you and your friends? We have the perfect bus to Manhattan Cruise Terminal to offer you a pleasurable ride to the terminal. No doubt, a cruise can be a disconcerting experience, especially if you have never gone on such trip before. However, we can make your experience to the terminal refreshing and relaxing to start you off on the journey. 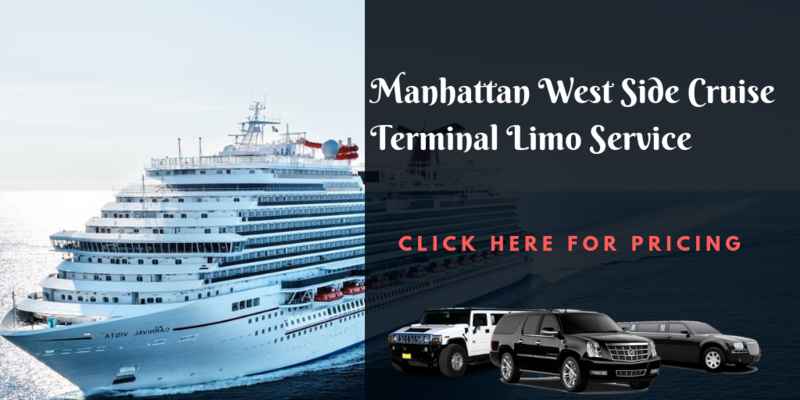 Our transportation to Manhattan Cruise Terminal from Long Island is designed to give you luxury and comfort at its best so you can anticipate the exciting howbeit an exhilarating cruise. If you are coming to New York City through the Manhattan Cruise Terminal and you are considering exploring the city, you can trust us to handle your movement without any fuss. Remember, you cannot keep any of your belongings at the terminal while you take a trip round NYC to enjoy the beautiful city. However, you can trust us to take care of your belongings, suitcases and any other thing you want us to keep for you as you explore the exotic New York City. Our shuttle service to Manhattan Cruise Terminal will be there with you all the way. Wherever you want to go, we will be delighted to take you there in class and style. Are you in Long Island and planning a trip to the terminal? We will be happy to make the perfect arrangement for you. You can trust our service to always deliver top notch service to you at all times. Our exceptional Limo Service to Manhattan Cruise Terminal from Long Island is the ideal choice for all your transportation needs during your stay in Long Island or anywhere in New York. We have a wide range of limos that you can choose from. All you have to do is let us know your preferred ride and we will ensure we make it available to you. You can trust us not to leave you stranded at the cruise terminal. We will be waiting for you and as soon as your cruise returns to the terminal, we will pick you up and take you to your destination. If you also desire car service from NY to NYC cruise terminal, you can rely on our service all the way. Whatever transportation needs you have, you can trust us to provide it for you.